During October, C.X. 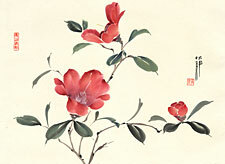 Silver Gallery (814 Western Ave., West Brattleboro) presents Jean Brewer: Chinese Brush Paintings. Jean remembers how she loved to draw and sketch when she was a child. Her grandfather was a self-taught artist, and her father built much of the furniture for the family, making fine cupboards, tables, and toys. Later, Jean enrolled in art classes at the University of Vermont and raised a family in Proctor. 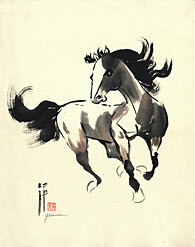 While working for a designer out West, Jean discovered Chinese brush painting, which then became her passion. For ten years she studied with Dr. Ning Yeh. 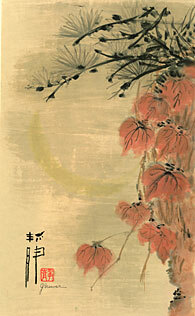 She recalls, "I was drawn to Ning Yeh immediately, his warm personality, his spontaneity; to the flow of the brush and the beautiful colors of the rice paper. There's nothing like the stroke of the brush on the paper." 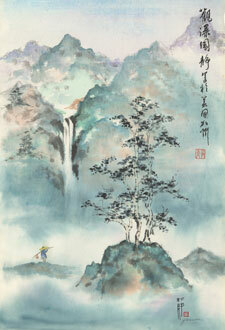 When she later relocated to Cape Cod, she enrolled in classes with Qingxiong Ma, at the South Shore Art Center. Jeanís work is in galleries in New England and many private collections throughout the United States. Now returning full circle to the Brattleboro area of Vermont, Jean states: "I would like to promote art appreciation and art as a destination in Brattleboro, and to enrich the area with my vision of mountains, rivers, landscapes, textures, and colors." Throughout October, Jean Brewerís delicate views into the natural world provide testament to hundreds of years of Chinese tradition transformed through the sensibility of a New England painter. An opening reception for the exhibit is scheduled at C.X. Silver Gallery during Gallery Walk on October 2, 5 to 8 pm, with live music performed by Jeff Brewer. On Saturday, October 11, 1-3 pm, Jean and Xi Cai will offer a joint workshop in Chinese calligraphy and brush painting at the Gallery, which is located at 814 Western Ave. in West Brattleboro. For more information, contact Adam Silver at (802) 579-9088 or visit wwww.cxsilvergallery.com.